Von ammon co.'s latest exhibit “MENTAL” opened Saturday taking over the once-barren warehouse at 3330 Cady’s Alley in Georgetown with digital neon artwork. Von ammon co. is not your average D.C. art museum. 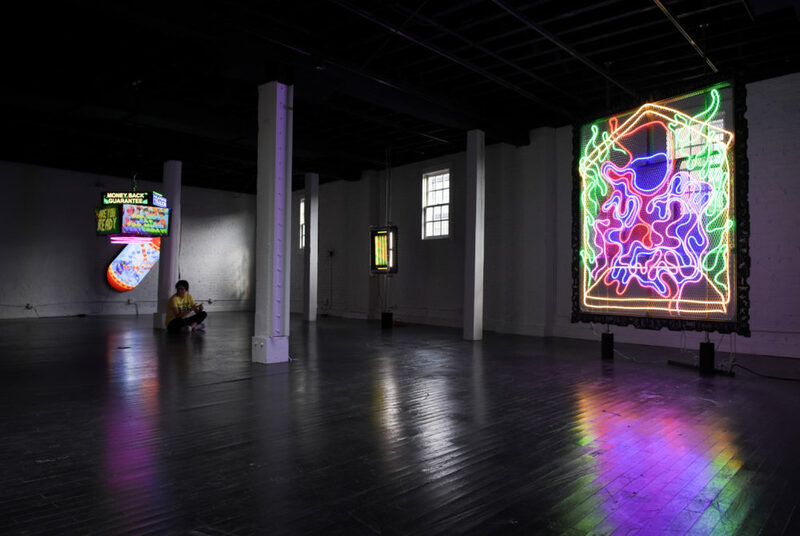 Its latest exhibit “MENTAL” opened Saturday taking over the once-barren warehouse at 3330 Cady’s Alley in Georgetown with digital neon artwork. The exhibit, which will be on display until May 25, features an array of funky digital pieces like a miniature Jumbotron and artwork displaying phrases like “dumb is smart” in bright colors and flashing lights. New York art dealer Todd von Ammon, the 3,320 square foot gallery’s owner, said he chose to open the work in Georgetown instead of New York because he wants to spread more contemporary art to D.C. and was alloted more space to work with in the District. von Ammon said he wants the works in his gallery to stand out from other D.C. artists by creating art that uses digital media to comment on issues like mental health and consumerism. The exhibit space is completely unfurnished, with bare walls and old cement pillars. There is minimal signage outside the exhibit, but once you walk inside the entire exhibit consists of signs covering the walls. While each piece is large, they seem small up against the otherwise bare warehouse walls. The pieces are all digital – meaning the art is constantly changing with flashing lights and moving animation – and feature bright and eye-catching colors like neon green, orange and pink. The ten installations that make up the “MENTAL” are by Tabor Robak. One installation from Robak’s collection, called “MiniJumbo,” features multiple digital screens that project phrases like “School is open” and “2 for 1 drinks.” The phrases are constantly flashing and the animated text spins and flies on and off the screen in bright pink, green and blue. A pill-shaped piece called “CHEAP ZEST” features an electric orange and blue image of the DNA double helix and a mock prescription label that reads “DR. SLEEP INN,” “FOR ALL ETERNITY” and other descriptors of the fictional drug. None of the pieces in the collection are labeled with a nameplate like in most museums, contributing to the gallery’s unfinished and unconventional aesthetic. With its distinct venue and constantly morphing artwork, “MENTAL” keeps visitors fascinated with flashy images and words. Anna Boone and Lindsay Paulen contributed reporting.